My true passion is nurturing families and newborns while providing support and education during that special time in their lives. I am DONA trained postpartum doula, ProDoula trained labor doula, newborn care specialist, certified lactation counselor and CPR certified. I have been a nanny for over 15 years, working with children of all ages. Throughout my career, I have provided mentoring and advice to nannies and mothers nationwide. A big proponent of continuing education, I have helped organized multiple nanny training conferences and workshops. I am 39 years old and live in beautiful Somerset County, NJ with my partner, Jeff and our two cats, Winnie & Boris. "Looking back I realize that regardless of all the reading and educating we were doing to prepare for Grace’s birth we really knew virtually nothing! While I fully support all that you can do and read to prepare yourself for the birth of your children, I really believe that the most important thing you can do is have an expert advising you, a mentor. It’s funny to think that when you change careers, take a new job, buy a car, pick a new neighborhood to move to, even buy a new lawn mower you consult with experts prior to making that decision. You ask mentors for advice, friends and family etc… But generally I have found with a baby, especially your first one you really don’t look for that mentor. You might reach out to your friends who are having their first baby’s and for the most part as clueless as you are or you might reach out to women in your family who had children in a different generation. I am not disrespecting these sources, you will get valuable information and support from these groups but I will tell you from my experience anyway for what it is worth there is nothing more reassuring than looking into the eyes of a baby expert when you have questions. An expert like Sara. " Maria D.
"When I had my son five years ago, I didn't even know about this service. I would have benefited from someone making sure that I was taking care of myself while I only focused on my son. I remember being so afraid that I would do the wrong thing or break him somehow! Sara was always a phone call away and is the Nanny of my best friend. I have watched Sara nurture two beautiful girls - from birth - with patience and grace. Her passion of caring for children still amazes me. 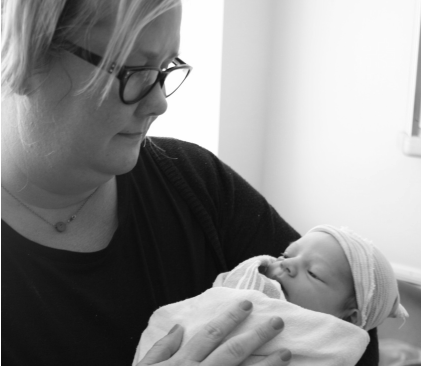 Sara's confidence around the newborn girls helped to ease my own fears about my precious little boy." Ingrid H.
"Sara was my very first baby nanny, when my son was just 2 weeks old. I was a new and clueless mom who was trying to figure out how this whole baby thing worked while also trying to figure out how to still be a good wife, friend, daughter, sister and (eventually) an employee again. I was a cool, calm and confident woman who became a little less of ALL that once my precious baby was born. I needed help! When I first interviewed Sara I was sold in seconds. You can tell instantly she is sweet and trustworthy. Her calm and nurturing demeanor is just what we needed. Sara was with us for a couple years and I was crushed when she moved away. However I still flew her into a family reunion to watch all of our family kids at night- that is how much I adore and trust her!! Sara is a natural and someone you can trust without any hesitation. I wish she would move back to Mpls! My son is now 11 so doesn't require and child services- but I would love to see Sara and meet for coffee!" Kristin R.